The luxury of a long, late night, in shadows that cloaked all deeds, fair or flagrant, gave us free rein of Pulau Sekudu this Friday, on a day of dry winds and air so dense it felt like a miasma of heat, a swathe of thickness and tightness that threatened to stifle thought, stir fright and turn brains into a sour slop, wanderings in a purgatory of uric pores, a stumble-through with no markers, no milestones, no intervals and no time to lose before the sun and tide return and release us from this survey of an amphibian island. The frog and other rocks that make up this islet shelter at their feet companies of crown stars, climber crabs, spiral melongenas, volcano barnacles, sea squirts, limpets and drills. Gentle slopes surround these formations and swell as dawn falls to reveal a landscape of untidy bays, of arms of sediment draped in weed and rubble, of buried rays and scooting stars. Carpets of Halophila and tangles of Ulva, which peter out into a flat of bare bottoms at the edge of the straits, teem with minute decapods, loose worms, dapper urchins, swimming anemones, naked snails and tiny Astropecten, many in a state of dishabille with arms, tubes and orifices aflutter. Under every stone is an orange portunid or a stone crab, or two, with sneering green eyes. In every hole, a claw snaps, an arm waves, a lidless eye. In every pool, countless nameless things swim, sit, stalk, slide and scatter before a light beam and a heavy boot. 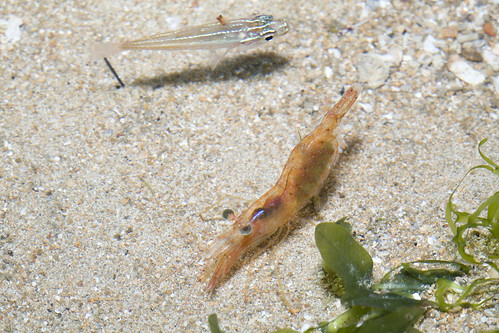 Night shrimps are small carideans in the family Processidae that live in shallow flats of sand or grass, emerging after sundown to feed on lesser invertebrates, flee from other nocturnal hunters and engage in trysts between partners in red, one of whom dons a soft breeding dress and issues notes of chemical excitement to turn a touch into a feeler-up and an affair that is barely skin-deep and ends with a cuticular pocket of spermatophores. 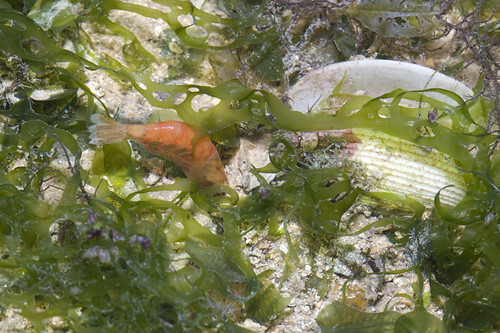 Processids remain a little-known group, understudied by carcinologists and overlooked by gourmands, save two sister species found in the Mediterranean and eastern Atlantic; in local waters, they occur in the seagrass meadows of Sekudu, Changi and Semakau as well as the coral rubble of Sentosa and the Sisters, but never seem as abundant as the palaemonids that prance about in tidal concavities, the alpheids that snuggle in dens of silt or the broken-back shrimps that lurk on bright green blades and in the dimmer reaches of broken reefs. 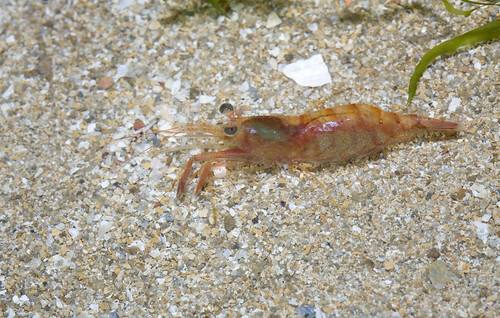 Large eyes with well-developed corneas and a short rostrum with an apical tooth are shared features of night shrimps, but the distinguishing feature of the family, save Ambidexter, an aberrant genus, are their dissimilar first pereopods: this pair of appendages, both of which are usually modified into powerful or dextrous chelae in most caridean families, consists in processids of a typical claw at the end of one arm and a strong dactylus or unclawed toe at the other. 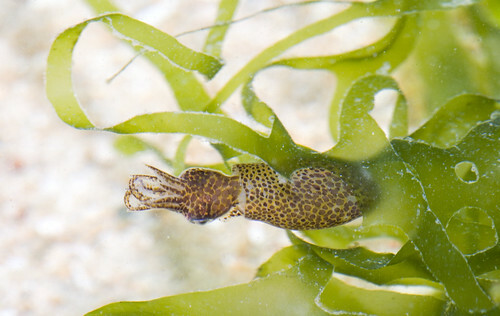 The second, often unequal, pereopods, meanwhile, are elongate and bear highly divided segments. The functional morphology of processids is a largely blank page: the crustaceans, clad in pigments that recall deep-sea cousins, are known to shun light and have fossorial habits. But little has been said, if at all, about how they hide. 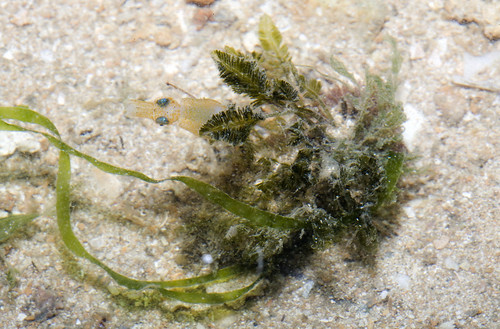 Bauer (2004) suggests that seagrass species "may well utilize preformed burrows". Penaeids, which abound in the same habitat at Sekudu, bury themselves by using their barrage of pereiopods to displace and sink into soft sediments until nothing but their eyes are exposed. Processids, whose last three pairs of pereiopods are spindly hallmarks of the caridoid facies, employ a quite different method of digging in. 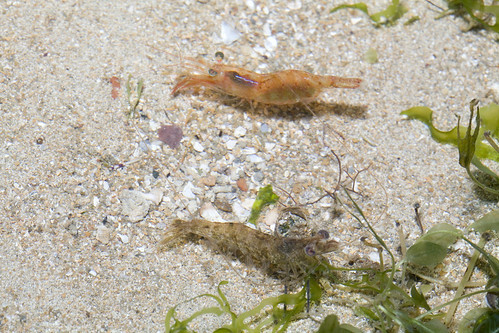 Two individuals, found separately in isolated puddles, adopted a curious head-down stance after attempts to weave out of sight hit weedy barriers; each animal, though heavily berried, then plunged its forequarters into the sand before the entire shrimp vanished beneath the grains, to levels deep enough to evade probing fingers. Whether or how the first pereiopods work, perhaps in concert with rather well-developed third maxillipeds, to achieve this feat is unclear, but the creatures' ability to evade capture and elude observers by entering a lower stratum should now mark a far from final frontier for students of little beasts that spend the day in holes of their making before popping up to paddle through a bed of darkness amid a sea of stars. Photo by Peter Geddes. 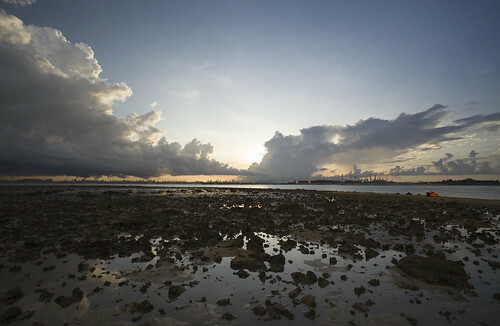 From Balik Pulau: Stories from Singapore's Islands, National Museum of Singapore, 2 June - 10 August, 2014. Every man is an island. And no more so than when the island lies dead, buried, burnt and banished to a hinterland of the mind, a life that lingered above the tide before sinking into dull recesses and clement states – unsaid, unfelt, undeserving of a hearing until a word or two, an innocent query, draws out a cry of anguish, of pain that can no longer be deferred or deleted, a punch in the gut of a man who found a world to his liking and tasted paradise before it was paved and forty years of work came to an end in a flat of four small walls. Other islanders, still hale and handy with bubu and boats, lurk on the fringes of flats that survive in an archipelago of tanks, cells and smokestacks. These terumbu were not their traditional hunting grounds, for the men sailed to more distant haunts, close to the lands of the fathers of their fathers. 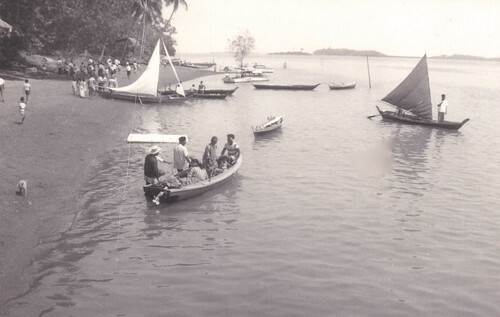 The reefs, just a few paddles away, belonged to the womenfolk, who once wandered on them early in the morning or in the dying hours of the day, clad in sarong and with bunga raya (hibiscus) in their locks, seeking spider conches, edible crabs, gulong and the gelatinous fruit of the sea. The sound of their chatter would waft towards the village and caress the ears of fishermen in huts by a shore of sand and coral, a barricade of natural mysteries before an isle of ease and eternity. 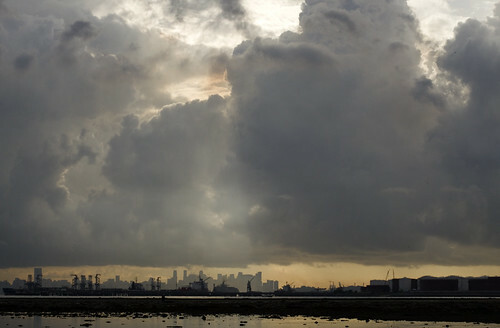 To the north, nine sullen islands, named after vessels, beasts and trees, guarded the borders of Jurong and exchanged words in the dark as voices floated from house to house, isle to isle and across the water, over mud, slope and shoal, to their kin by the coast, to villas where gin, tonic and trust were traded, to the tip of Tanjong Kling where pleasure was launched and the past resides, in fits and empty starts, in eyes of bright blue and distant frowns. Few return to the islands today, and fewer still reside on them, but for accidents of history that gave rise to an abode of pilgrimage, a minor attraction in a city of far more luxurious sights. Some continue to endure the ride to these shrines, though in scantier numbers than the flotillas that used to surround the turtle at high tide and unleash a mob of nonyas, grand- and would-be mothers, hawkers, beggars, captains of twakows and champions of commerce who clambered out of rocking sampans, waded across a bridge of sand, walked up a hill and prayed to a trio of saints before attaching their desires, in codes of primary colours, to sundry boughs and offering token and tribute to the grand old uncle of the southern sea, patron of sailors, protector of sojourners, a god who looks east and askance at the port that sought his favour only to forget his name. Few return to the islands today, for many have bid farewell to their homes and others have burnt their boats, preferring to save the worst for last and spare the powers that be the trouble of scuttling their craft and sending the owners the bill for a grave on the bottom of a dire strait. Those who still do so, who charter bright yachts and dingy ferries to greet the dawn and land between lanes filled with ships that could crush a reef or islet with half their hull, find piers with happy names and silent walls, barriers of misery to both history and humanity that displaced a century or more of coastal settlement and banished old reefs to the margins of a maritime hub. Some corals have returned, but not all can take the heat and the polyps grow in waters that have turned cold and no longer tell stories of pirate queens, watchful dragons, ancient duels and wrathful spirits to frighten and frustrate the children of a flagrant harbour. Few now return to the straits to find islands of ease, islands of confinement, islands of refuge, islands of industry, islands on fire, islands of light, islands of shadow, islands of trees that have lost their roots, islands of cats, islands of goats that devoured nearly all vegetation, bald islands, barren islands, islands of stone, islands of evil, islands of laughable loves, islands of fatal, forbidden ties, islands of revolt, islands of seclusion, islands that have found a second life as habitats in harmony, button islands, butttressed islands, islands lost to the waves, islands left to rot, islands of no account and islands of last resort – names without places and places without names. Every island has a story, but not every story has a tail. The islands remain in place but have grown distant and detached, the wind has abandoned their sails, their myths have lost their makers and their children now reside in flats that the tides can never touch, where time passes with a sigh and each day is a dream gone bad, a life cut short and caged with nowhere to go, no way out and no way back.